WIM is a common format Windows uses to distribute files and folders in a single compressed archive. 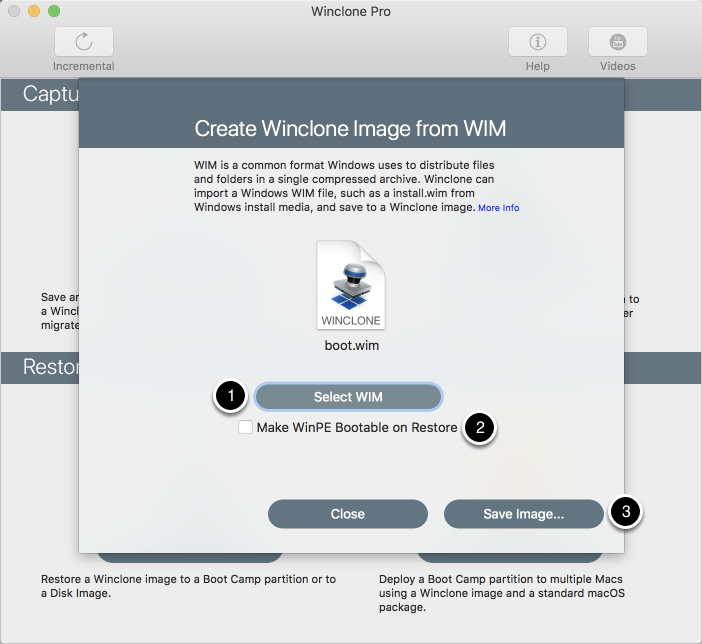 Winclone can import a Windows WIM file, such as a install.wim from Windows install media, and save to a Winclone image. Select WIM will open a standard macOS open dialog to select a WIM file. A WIM file can be obtained from any Windows installation media or from boot media created by Microsoft Deployment Toolkit. On install media, the WIM is typically called Install.wim and located in the sources folder. Mount the Windows ISO install media and look in the sources folder for the install.wim. Make WinPE Bootable on Restore option will save a setting in the image that will cause the restored Winclone image to be booted in WinPE mode. Note that only a WinPE WIM will work with this option.